When you author a map to publish as a feature service, you need to consider the purpose of the feature service and where the data for the feature service is stored, as that affects how you create, manage, and use the feature service. This topic covers authoring a feature service to be published to a stand-alone or federated ArcGIS GIS Server site and having the feature service reference the data in a geodatabase or database you have registered with the GIS Server site. Before you author your map, prepare the data to meet feature service requirements and register your data stores with the GIS Server site. Once your data is ready, create and configure a map that contains the data you want to publish, define symbology and other data properties within the map, and define a feature template for the editing environment (if you want the feature service to be editable). After you prepare and register the data, add it to a an ArcMap document and set properties on the layers and tables. These properties define how the data appears and what the client can do with the data. Once you define the data, add it to an ArcMap map document you want to publish, and set properties on the layers and tables. These properties define how the data appears and what the client can do with the data. Map document configuration is similar for both database and geodatabase data. However, if your map document contains geodatabase data, you can configure your map to take advantage of extra functionality available only in geodatabases before publishing. When you add a feature class or table to a map, the default name is the fully qualified name of the table within the database. At minimum, you should change the layer name so it does not include the database and user name. Right-click each layer in the table of contents and click Properties. On the General tab, type a useful name that represents the layer's contents and does not include the database and user name. For example, if you add the feature class, rivers, to the map from an enterprise geodatabase named mygdb, and the feature class is owned by the user gdbdata, the default layer name in the map is mygdb.gdbdata.rivers. Change the layer name to rivers. You might change the layer name even further if you set a definition query on the layer that changes what features are displayed in the map. For example, if you set a definition query so that only rivers within 5 miles of a mine are displayed, it would be useful to change the layer name to reflect that; for example, set the layer name to rivers near mines. If the feature class participates in a relationship class and, therefore, related data will be included in the service you publish, you might change the layer name to reflect that. For example, if the rivers feature class participates in a relationship class that joins it to a table containing watershed information, you could change the layer name to rivers and watersheds. A feature service allows you to query features and also get the features' symbology. Clients can use this information to draw features with a symbology that is consistent with what is defined on the service. The symbols returned by the service are based on the symbology of the layers in the ArcMap document. Each symbol in each layer is referred to as a type. For example, a layer symbolized with a simple renderer (one symbol) has one type. If a unique value renderer is used, a type returns for each unique value in the renderer. Feature services support simple, unique value, class break, and cartographic representation renderers. If you use an unsupported renderer, the service will not start. Use the ArcGIS Server log to determine which layers have unsupported renderers. Feature services published from ArcMap do not support proportional symbols or unique value symbology based on multiple fields. When a map service with feature access starts, the symbols are checked and downgraded if needed. In cases in which a downgrade is required, a warning is added to the server log to describe which symbols were downgraded. It is also important to note that if you have layers in your map document that use cartographic representation renderers, the renderers are reported as unique value renderers when clients access the service through REST. Esri recommends that you use RGB colors in the symbols; otherwise, minor changes may occur when the colors convert to the RGB color format. Inserting new features through a feature service is accomplished using the feature templates from the map document. A template allows you to digitize a new feature and have the attribute's default values set accordingly. Feature services require that a template exist for each feature type. When you start an edit session or publish the service, a default template is created for each type. Default templates are always used for database data. You can create customized templates to use with geodatabase data. See the Custom feature templates section for more information. Feature services only display 1,000 features by default. Set the scale range for the feature layers in the map you publish so the layer will not display in a scale at which more than the maximum number of features would appear. To set a scale range for a feature layer, right-click the layer in the ArcMap table of contents and click Properties. Set the Scale Range on the General tab of the Layer Properties dialog box. Field properties set in ArcMap are exposed through the feature service; this includes field aliases, field visibility, and a field's read-only property. Read-only fields include system-managed fields, such as ObjectID, globalid, and editor tracking fields (geodatabase only), as well as fields set to be read-only in the map document. When applying an update, if a value is set for a read-only field, the feature service ignores the value. When applying an insert, default values are applied for read-only and invisible fields. If default values have not been defined, nulls are applied. If the field cannot store null values, the insert fails. Layer descriptions and credits (copyrights) specified in the map document are exposed for each layer in the feature service as a layer description and copyright information, respectively. Feature services support HTML pop-ups configured in ArcMap. HTML pop-ups are a powerful and easy way to share HTML-formatted information about features. They work much like the Identify tool, except that the displayed information can be customized HTML. For more information about how to set up HTML pop-ups in ArcMap, see Setting HTML pop-up properties for feature layers. If you work with your feature service on the web and you want pop-ups to be available, consider defining them in Map Viewer instead. Alternatively, developers can use the client API itself to define pop-up styles. Feature services support temporal data—data that represents a state in time. Store time information in single or multiple attribute fields, and use this information to visualize data at particular times or in time intervals. To expose temporal data for a layer through the feature service, enable time on the Time tab of the Layer Properties dialog box. For more information about how to enable time on a layer, see Enabling time on your data. The map document you publish as a feature service can contain layers that have different coordinate systems. When clients access the feature service, the feature service translates the coordinate system if needed. For example, if a client inserts a feature through a feature service using a coordinate system that is different from the coordinate system of the layer, the feature service converts the feature's coordinate system to match the layer's coordinate system before storing the new feature. Spatial queries involving geometries also convert to the layer's coordinate system before being applied to return the correct results. The feature service also uses geographic (datum) transformations if needed. For example, if the layer is stored in NAD27 and a feature is inserted through the service with a coordinate system of WGS 1984, a WGS 1984 to NAD27 datum transformation is performed before the feature is stored. You can control the transformation method by setting up transformations in the data frame properties of the map document before publishing. A default transformation is performed if one is not defined in the map. Although you can publish separate layers that have different coordinate systems, all records in an individual table must use the same coordinate system. You can define attribute joins for layers or tables in the map document. When you publish a map service with feature access capability to a GIS Server site, joined columns are included in the map service but are not included in the feature service. The feature service includes only the columns from the join table (the table or feature class on which you defined the join). If symbology for the layer is based on a joined column, the map service includes the renderer you used to symbolize features, but the feature service reverts to a simple renderer. If the renderer in the layer is based on a column from the left most feature class in the join, the map server and feature server include the renderer. You cannot publish joined data to an ArcGIS Enterprise portal or ArcGIS Online. Remove joins before publishing a feature service (hosted feature layer) to either of these applications. If your data is stored in a geodatabase, you can take advantage of some additional functionality. Configure this functionality before publishing a feature service. If the data you publish is in a geodatabase, configure your datasets to use subtypes and attribute domains where appropriate to enhance the user experience of the feature service and prevent data entry errors. These provide ways of categorizing your data and ensuring that appropriate values are entered when the data is edited. Feature services can detect and use the subtypes and domains. For example, if you have a domain limiting the color of a fire hydrant to red, yellow, or blue, you see a drop-down list in the web application that allows you to only select one of those three colors. If you publish a feature service without copying data, subtype information is included in the feature service independent of the renderer you use. If you will publish a feature layer to ArcGIS Online or an ArcGIS Enterprise portal, subtype information is included only when layers are published using a unique value renderer on the subtype column. Within ArcMap, you can create templates or modify existing templates to customize the editing experience through the feature service. This includes setting a default construction tool, which is used to create that type of feature. If you remove a template for a particular feature type, a default template is created when you publish. There are different types of construction tools available depending on the type of feature the template creates. For example, if you have a line template, you can only select tools that can be used to create line features. The construction tool saved with the templates is available through the feature service. The only exception is the point tool called Point At End Of Line, which is not supported by feature services. For more information about templates, see Setting feature template properties. When the map document is saved, the templates are saved with the layers in the map. When the map document is published, these templates are available for feature service clients. Once the layers, types, and templates are defined in your map document, you are ready to publish the service. Feature services allow you to query and edit attachments. An attachment is a media file associated with a feature or object in a geodatabase. For example, with attachments, photographs and videos can be added to a bird sighting and viewed when the sighting point is clicked. To use this feature, datasets within a geodatabase must first be configured to support attachments. When these datasets are added to a map document and published, clients can query, insert, and delete the attachments through the feature service. There are limits imposed on the size and file types you can attach to a feature service. To learn more about these limits and how to modify attachment settings, see Uploads in the ArcGIS REST API help. For more information about how to configure a dataset to support attachments, see Enabling attachments. The following section walks you through an example of how to set up a map document, define the data, and define the symbology exposed through a bird sighting feature service. The feature service allows members of the birding community to post their bird sightings directly on the map and attach media files, such as photographs, audio files, and video files, to the specific observation points. The steps in this example are applicable to geodatabases and databases; however, feature attachments and custom feature templates are not available in databases. You can ignore the content that discusses this functionality if the data you're working with is not stored in a geodatabase. The first step in authoring a feature service is defining the data that will be available through the service. In this example, start with a feature class called Bird_Sightings in a geodatabase. To have attachments associated with this feature class, attachments have to be added in ArcCatalog or the Catalog window in ArcMap. To do this, connect to the database, right-click the feature class, and choose Manage > Create Attachments. This creates a table that stores the attachments and a relationship class that relates the feature class to the attachments table. For more information about how to add attachments to a feature class, see Enabling attachments. Certain types of data in enterprise geodatabases must be registered as versioned to allow editing. This same requirement also applies to editing feature services. For more information, see An overview of traditional versioning. With the data set up, the next step is to add the data to ArcMap and define the symbology. The symbols returned by the feature service are based on the symbology of the layers in the ArcMap document. Each symbol in each layer is referred to as a type. 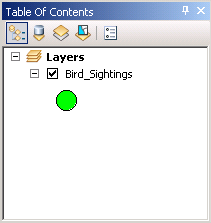 In this example, by default, the Bird_Sightings layer is symbolized with a simple renderer (one symbol). However, in this case, you want to symbolize the bird sighting layer based on the type of sighting. To do this, a unique renderer can be used. To change the way a layer is rendered, right-click the layer and choose Properties. On the Layer Properties dialog box, click the Symbology tab and choose Unique values under Categories. You can then select the field you want to use to symbolize the layer. In this case, there are three unique types of sightings (bird sighting, nest sighting, and rare bird sighting); therefore, three types (one for each sighting type) are returned by the service. Unique value rendering results in three types for the Bird_Sightings layer. Now that the renderer is selected, the next step is to choose the symbols that represent each sighting type. 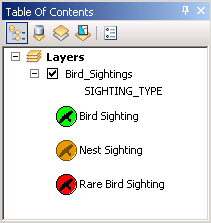 In this case, a bird symbol is selected from the Esri symbol selector. The foreground and background colors are set differently for each type of sighting so they can be easily distinguished in the feature service. When the map document publishes, the symbols convert to PNG graphics, which are returned to the client. Character marker symbols are used to symbolize the different types of bird sightings. Once the symbology is set up, the next step is to define the editing environment that will be available through the feature service. The goal of this feature service is to allow bird enthusiasts to enter bird sightings and all relevant information onto a map. Editing through a feature service is accomplished using the feature templates from the map document. If you do not create templates, a default template is created per type when you publish the service. However, you can also create templates or modify existing templates to customize the editing experience. In this example, you want to create templates for this feature service. To do this, right-click the feature class, choose Edit features, and choose Organize Feature Templates. Under Layers, select the layer and click New Templates. The Template wizard appears, where you can create templates. Choose to create templates for all the different types of bird sightings. Once templates have been created, copy them to create additional templates. For this feature service, you want to add an additional template for the rare bird sighting type. Rare bird sightings can be for birds that are in the area out of season or endangered. To create a copy of a template, select the template you want to copy and click Copy. In this case, a copy of the rare bird sighting template is created so that each can be customized to represent the two types of rare bird sightings. To customize a template, double-click it in the Organize Feature Template window. This brings up the template properties, where you can edit the name of the template as well as the default field values. The template for endangered rare bird sightings has the sighting type set to Rare Bird Sighting and the description set to Endangered. The template for out-of-season rare bird sightings has the sighting type set to Rare Bird Sighting and the description set to Out of Season. The rest of the attributes can also be set to appropriate default values within each template. In this case, endangered rare bird sightings require a follow-up survey, so the Follow up attribute can be set to default to Yes. A follow-up is not required for out-of-season rare bird sightings; therefore, the Follow up attribute can be set to No. Setting some of the attributes to default values in the templates streamlines the editing experience for end users because they have to only select the type of feature and digitize it. Once the layers, types, and templates are defined in your map document, you are ready to publish the service. After it is published, end users can access the service through web clients or ArcGIS Desktop for querying and editing. For more information, see Publish a feature service from ArcMap. If you need more guidance in how to set up and use a feature service, the following tutorials provide step-by-step examples of how to set up a map document, define the data, and define the symbology exposed through a feature service to perform web editing. The tutorials vary depending on whether you've stored your data in an enterprise geodatabase or database.